Note: This “Numeric Network Addresses” section is in a section related to numbers. For additional types of network addresses, see: network addresses which cover network names. An IPv4 address takes up 32 bits (according to RFC 791: IPv4 pages 7 and 42). The most common form (also specified by RFC 791 pages 7 and 42) is two separate the address out into four fields/parts. Each field represents a fourth of the 32-bits, so each field is an octal byte (8 bits). Each field is a number ranging from 0 (zero) through 255. These fields are also most commonly separated by a period. This format of having four fields, separated by periods, has led to the term “dotted quad”. It does seem likely that the IPv4's protocol intended that each computer on the network could have its own network address. However, that idea seemed more valid when the Internet was still envisioned to be a network between universities and large organizations with budgets for exploratory technology. It probably seemed likely, at that time, that if the world was to ever embrace the concept of a worldwide computer network, that the worldwide network would be a new network that completely replaced the existing experimental network. After the time of some of these design decisions, the decision was made to allow this Internet to be directly used by more of the general public. Since the Internet grew beyond the initial expectations, the address space of the Internet became insufficient to keep providing IPv4 networks (especially of any reasonably requested size) to every organization that would be interested in one. In the short term, one way to help with the impending address shortage was to use NAT (or, more specifically, PAT). This allowed addresses to be used much more conservatively. However, IPv6 is a nicer solution for providing more addresses. Private addresses are defined by IETF BCP 5: “Address Allocation for Private Internets”. Actually, knowing the related RFC number, RFC 1918, can be quite useful. The simple reason is that this is a fairly well-known RFC number. (This is probably the most well-known RFC number.) This RFC number does get used by firewall documentation. This is because RFC 1918 (“Address Allocation for Private Internets”) is often referred to by the industry, such as being seen in official documentation of network products. One example is the manual page for the /etc/pf.conf file used by OpenBSD's pf. Additionally, (other) online documentation by that firewall mentions RFC 1918. Cisco documentation may also refer to these as “RFC 1918” addresses. Because these addresses are used by training material (such as books written for schools, and manuals for people who may work with products), there is a fair amount of familiarity with these addresses. The term “nineteen-eighteen address” does (at least occasionally) actually get heard during verbal conversations about technology (including when a couple of people are conversing with each other, as well as presentations/seminars). So, if there is any single RFC number that is more commonly useful to memorize than any other RFC number, this one (1918) may be it. The three address ranges are: the IPv4 10/8 address range and the 172.16/12 address range and the 192.168/6 address range. Commonly, a lot of equipment defaults to using 192.168/16 and, probably often for just that reason, that is the address range most commonly used by small organizations. Organizations using larger amounts of IPv4 addresses are often found using the the IPv4 10/8 address range. Except when there actually are huge amounts of addresses being used, there really is often no reason why one of these private address ranges must be used over any other different one. In fact, using the less frequently used address range may reduce the likelihood of eventual IPv4 address conflicts (such as when networks might merge to some extent, such as when one business buys out another business, or simply when a VPN is used to “combine” networks to some extent). and The IPv4 address range 203.0.113/24 (“TEST-NET-3”). So, an IPv4 address is an example/documentation address when the numbers before the third period match one of those address ranges. For example, 192.0.2.30 is an example/documentation address. 192.0.20.30 is not from those groups of example/documentation addresses, because the numbers before the third periodo do not match. The optional leading zeros are typically chopped off, but in case they aren't, understand that 192.000.002.030 is the same thing as 192.0.2.30, so that is also an example/documentation address. An overview of some special-use addresses is at IETF BCP 153: Special Use IPv4 Addresses. For more details about other addresses, see: IPv4 address usage. An IPv6 address has either seven colons, or a single pair of colons as well as up to five other colons which are not directly next to another colon. Each colon which is not part of a pair of colons is surrounded by one, two, three, or four hexadecimal digits on each side of the colon. The pair of colons is adjacent to at least one, and up to four hexadecimal digits on at least one side of the pair of colons, and (very) possibly on both sides of the colons. If there are zero hexadecimal digits before the colon then it is at the beginning of the address and if there are zero hexadecimal digits after the colon then it is at the end of the address. RFC 4291: IPv6 Addressing Architecture, section 2.2: “Text Representation of Addresses” provides the three official rules. The first two “conventional forms” are well-known, and well supported by lots of IPv6-supporting software. The first form specifies that colons are inserted between the hexadecimal digits that represent each group of 16 bits out of the 128-bit addresses. The second rule notes that a single double-colon can represent multiple other colons, including any zero that would be replaced by those colons. There was some discussion of making IPv6 a protocol using 64-bit addresses (or perhaps 96-bit addresses). RFC 1715: The H Ratio for Address Assignment Efficiency starts off by stating, “A substantial part of the "IPng" debate was devoted to the choice of an address size.” (That article goes on to discuss some limits previously experienced with numeric addresses, such as the formats of phone numbers that have been used in multiple nations. The article states that “there is no question” ... “that 128 bits is” beyond sufficient.) Clearly more bits for the addresses would have helped, but some discussion was needed to figure out just how many bits should be used. A thirty-third bit would have allowed an Internet that had twice as many possible addresses as the existing 32-bit IPv4 Internet, and the thirty-fourth bit would permit a network twice as large as that. Even 64-bits would have represented a substantial increase in size, and allowed IPv6 to permit many, many more addresses than IPv4. However, instead of 64-bits, the eventual official decision (that has become widely supported) ended up being an agreement to use 128-bit addresses. That doubles (and, therefore, exponentially increases) the number of addresses an additional 64 times compared to IPv4. (A single double would provide twice as many addresses as what the IPv4 Internet can provide. This doubled, and doubled again, and doubled again, for a total of 64 times that the address size was doubled.) This gigantic enlargement was done to intentionally make plenty of addresses. There are so many addresses available that the current plan is that each person will have more than 32-bits (which was the size of the entire IPv4 Internet). Unlike IPv4, the IPv6 standard has been designed to have enough addresses to easily afford massive address waste even on a worldwide scale. If IPv6 used 64-bit addresses, there would have been 18,446,744,073,709,551,616 addresses. Instead, that is how many addresses are in each IPv6 /64 subnet. Individual have often given a /48 subnet with 1,208,925,819,614,629,174,706,176 addresses. This is ofen used to be split into 65,536 groups of IPv6 /64 subnets. The number of IPv6 addresses is 340,282,366,920,938,463,463,374,607,431,768,211,456 (three hundred forty undecillion, two hundred eighty-two decillion, three hundred sixty-six nonillion, nine hundred twenty octillion, nine hundred thirty-eight septillion, four hundred sixty-three sextillion, four hundred sixty-three quintillion, three hundred seventy-four quadrillion, six hundred seven trillion, four hundred thirty-one billion, seven hundred sixty-eight million, two hundred eleven thousand, four hundred fifty-six). It would be natural for people trained in frugal assignments of IPv4 addresses, having been made well aware of historical waste and subsequent problems, to not want history to repeat itself. Such concerns are clearly addressed by RFC 3177 section 4. One reason for the decision to give out so many addresses is that the people designing the IPv6 standards wanted addresses to be heavily used. There is benefit perceived in having people use many addresses. If people use many addresses early, this may help researchers to be able to better see what does work well and what does not work well. That information may help policy makers to be able to make more informed decisions. If problems are learned early, perhaps a re-design can be implemented earlier, and that may affect more addresses than if the fix gets designed later. So, unnecessarily conserving IPv6 addresses may actually cause more harm than good (unlike the IPv4 network, which was designed in a different way). People are encouraged to go ahead and heavily use (or even waste) many IPv6 addresses. Think of using IPv6 addresses like breathing air. In some movies that portray a disaster scenario (with potential tragedy), a person in a submarine or a space ship or an isolated cave may follow some advice to remain calm and breathe slowly, because that will use up less air. This is because air may be a limited, and therefore a precious, resource, and breathing slower will use up less air. Taking actions to limit the usage of this precious resource makes sense. Now, compare that to a person who is standing on solid ground where air is plentiful. If a person decides to breathe in and out very heavily and quickly many times in a row, then breathable oxygen-filled air is getting used up more quickly. Who cares? There's plenty around. Such a person may be ridiculed for making unnecessary noise, or perhaps risking hyperventilation and subsequent fainting (which may be, at the very least, embarrassing). However, what is not likely to happen is that people will criticize the person because they are using up the air too quickly. (If the person does get criticized, the reason for the criticism is not going to be because the air got used up.) As critically important as air is, there is an abundance. Perhaps a corporation could pollute air in a way that causes concern, but a single person's breathing is not going to meaningfully affect the amount of air in an area with many trees. Similarly, there's no reason for people to be feeling particularly worried and cautious about using up an IPv6 address, or even millions of IPv6 addresses. There are *plenty* of them! RFC 3177 did note that in the future, people “will still have the option of imposing much more restrictive allocation policies on the remaining” large amount of unused addresses. It is a bit comforting to see that actually happened (when RFC 6177 was implemented), rather painlessly. When IPv4 was designed, the plan was not initially to have that network be a worldwide network that was heavily used by the general population. When IPv4 did start getting used more widely, some design choices were changed, although people did try to not take resources away from people who were already given resources. The IPv6 design was made with a totally different plan in mind. It is was designed to have plenty of addresses. See: RFC 4291: IPv6 Addressing Architecture, section 2.8: “A Node's Required Addresses”. It may be helpful to first review RFC 2460: “IPv6”, section 2: “Terminology”. RFC 4291 section 2.8 starts talking about just hosts, but then the later section notes, “A router is required to recognize all addresses that a host is required to recognize, plus” more addresses. So the first section does apply to all nodes. Private addresses: the FD00::/8 range. An overview of some special-use addresses is at RFC 5156. For more details about other addresses, see: IPv6 address usage. 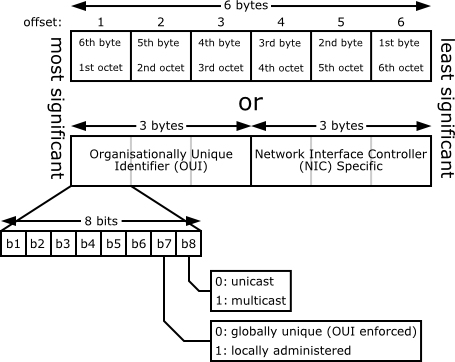 An eighth bit of 0 is Unicast, and 1 is multicast, per Graphic of MAC-48 address (hosted by Wikipedia) (which is a graphic used on Wikipedia's page for “MAC address” “Address details”). This ends up meaning that Unicast addresses have a first byte which is even. That bit represents whether it is univeral or locally administered. This means that all MAC addresses that are universal (not local) should have a second digit of zero, one, four, five, eight, nine, C, or D. Otherwise, that bit is set to one, which indicates a “Locally Administered Address” (“LAA”). Based on the above, a NIC (with a publicly/universally assigned Unicast address) is likely to use an OUI-24 that has a second (hexadecimal) digit of 0, four, eight, or C. This is largely represented by the public listing, although there may be some rare exceptions (11-00-AA and AA-00-?? addresses). Good addresses to use for local assignments (for devices that will be communicating using Unicast, which is the most typical type of communications), are ones that have a second (hexadecimal) digit of 2, 6, A, or E.
Public listings: When an OUI is allocated for use by a specific organization, in most cases that organization is publicly identified. So, when a manufacturer is given an OUI to use, people can look up details to identify any public assignments. What this basically ends up meaning is that the OUI in a device's MAC-48/EUI-48 address can typically identify what company manufactured the network circuitry of that device. An IEEE IAB is similar to an OUI-24, except that the first 12 bits are used by IEEE and are not available to the purchaser of the IAB. This allows the IEEE to subdivide a larger OUI-24 into smaller allocations called IABs. The costs for an OUI, IAB, or EtherType Field has noted an IAB's cost of $550, which is a third of the $1,650 price which was (and perhaps still is) the cost of an OUI-24. The maximum number of addresses that may be used within the 12 bits available to the purchasing organization is 4,096 addresses. Despite costing a full third of a OUI's price, the 4,096 addresses in an IAB is substantially smaller than a third of the number of addresses in a full 24-bit OUI, which is 16,777,216 addresses. So the cost per address is much higher (and so will be quite unattractive to an organization that will utilize many addresses), but the overall cost is lower. The IABs that have been assigned may be viewed at IEEE's public IAB listing. In common practice (even if, by some technical definitions, this is not technically accurate) EUI-48 is simply a new name for what has previously been called a MAC-48. (For all the available details about the difference between EUI-48 and MAC-48, see the section about MAC-48.) There is another standard called EUI-64 which this term does sound closer to. However, many technicians have learned the term “MAC-48” (or, more likely, the older term “MAC”) for years, and so that term may be more familiar. An EUI-48 address may be converted to an EUI-64 (which, the name may sufficiently imply, in fact is 64 bits) by either inserting 0xFFFE after the OUI-24 and before the other bits (as shown by Wayback Machine @ Archive.org archive of IEEE's EUI64 tutorial). In practice, another option may be to treat the address as an MAC-48, and performing a similar process to convert the MAC-48 into an EUI-64 (by inserting 0xFFFF after the OUI-24). To convert to EUI-64, see IEEE documentation (which may simply redirect to IEEE documentation in PDF format) which states to insert 0xFFFE after the OUI-24 of an “Encapsulated EUI-48 Value”. The same documentation shows that MAC addresses may also use 0xFFFF after the first 24 bits, but after converting the address from canonical to non-canonical format. Such a converted address becomes known as an “Encapsulated MAC-48 Value”. This would suggest the difference between MAC-48 and EUI-48 may be whether the address is canonical. The section on MAC-48 indicates a different, even less impactful, distinction. Although IEEE may not officially agree with this as an officially accepted practice, treating an EUI-48 as a MAC-48 would likely cause no problems in many cases (even most cases... and really, probably all practical cases). When there was ever any meaningful distinction between an EUI-48 and a MAC-48 (if there ever really was one), Wikipedia's section of the addressing details of MAC addresses notes that these two separate types of addresses were “assigned from the same numbering space.” (For further details about MAC-48 addresses and/or the difference between MAC-48 and EUI-48, see the section about MAC-48.) From the documentation about converting to EUI-64, it appears the simple difference had to do with EUI-48 being canonical format, and MAC-48 being non-canonical format. This ends up being more of a matter of notation than unique addressing, as described by the section about EUI addressing: canonical format. A MAC address is 48-bits and has also been known as a MAC-48, although the term “MAC-48” has since been considered obselete by the IEEE (according to a Wikipedia note about MAC-48). A MAC-48 is “assigned from the same numbering space” and “syntantically indistinguishable” from an EUI-48 address (quoting Wikipedia's section of addressing details for MAC addresses). Before MAC-48 was considered by the IEEE to be an obsolete term, the only real difference between a MAC-48 and an EUI-48 is that the numbers assigned by IEEE for use as MAC-48 addresses were meant to be “used for network hardware” (quoting section on Wikipedia (from April 10, 2010) of addressing details for MAC addresses), whereas the numbers assigned by IEEE for use as EUI-48 addresses were, “used to identify other devices” (which are not network hardware), “and software.” Of course what would a device need an EUI-48 for if it was not hardware capable of communicating on the network? (Perhaps what was meant is devices, like printers, which provide a primary purpose other than to help with the communication of network traffic.) So the difference between EUI-48 and MAC-48 is really unimpactful. The insignificant difference was significant enough to get a mention by RFC 4291 page 22, which references “the differences between IEEE MAC-48 and EUI-48 identifiers.” However, no technical changes were needed, because MAC-48 identifiers and EUI-48 identifiers were functionally equivilent. A MAC-48 address may be converted to an EUI-64 (which, the name may sufficiently imply, in fact is 64 bits) by either inserting 0xFFFF after the OUI-24 and before the other bits (as shown by Wayback Machine @ Archive.org archive of IEEE's EUI64 tutorial). In practice, another option may be to treat the address as an EUI-48, and performing a similar process to convert the EUI-48 into an EUI-64 (by inserting 0xFFFE after the OUI-24). Media Access Control. This refers to the fact that this is the address used by the protocols that interact directly with the “media”, which is a term referring to the wiring for wired networks, and the equivilent resources (like airwaves) for other technologies (like Wi-Fi). Another example of media is the light beams used by IrDA. Burned-In Address. This refers to the idea that the MAC address is unique for every network card, and is written into ROM or some other not-often-written memory. However, newer cards typically do have the BIA written in some form of memory which is actually writable. Ethernet Hardware Address. Perhaps the worst of the names that are available and (at least somewhat) widely used, because this type of address is also what would be used if a non-Ethernet network (such as the historic “Token Ring” standard) were to be used. LAA specificaly refers to a “Locally Administered Address”. This is a term that is used when someone other than the original manufacturer is assigning the address. (So, this is similar to the “private-use” IP addresses.) In theory, the “local administered” bit will be set to 1, which will cause the second hexadecimal digit to be a 2 or 6 or A or E. However, MAC address spoofing is possible (both by attackers, and by people who may have a legitimate purpose for wanting to use a specific MAC address that had previously been used). With the exception of LAA (possibly having the additional connotation/implication of being a “private” address), these terms effectively all have the same meaning, and may be used interchangably. Further details, such as whatever trivial differences may exist between EUI-48 and MAC-48, may be covered by glossry entry: Media Access Control and/or glossary entry: EUI. Based on that picture, it appears that the seventh bit is used to determine whether the address is considered to be “globally unique (OUI enforced)” or “locally administered”. That is consistent with the section on OUI LAA documentation/Locally Administred MAC-48 Address documentation. However, if seems that we may get a different story when looking at a graphic file from IEEE, Wayback Machine @ Archive.org archive of Figure 1 from the IEEE tutorial on MAC addresses (which was used with documentation that came from IEEE, Wayback Machine @ Archive.org archive of IEEE tutorial on MAC addresses). It seems that this picture from IEEE shows the second bit is the “Universally/Locally Administered address bit”. Is Wikipedia's documentation wrong? Actually, adding to the confusion: The graphic shows a “Hexadecimal Representation” of AC-DE-48-00-00-80. However, the “Binary Representation” shows “0011 0101 0111 1011 0001 0010 0000 0000 0000 0000 0000 0001”. Using Super-fast converting between binary and hexadecimal (or a slower method, if preferred), those first eight bits look like they should convert to “35” in hexadecimal, not “AC”. Was the author at IEEE just completely confused when creating the graphic? The simple answers are: these are not outright errors (even if they may be a bit confusing). In most cases, when writing numbers, the most significant numbers are written out first. Therefore, to display a value representing two hundred and one, the number is written as 201. The format may refer to “MSB format”, which refers to the “most significant bit(s)” (or, not really any different, the “most significant byte(s)”) being transmitted first. MAC addresses may sometimes (but not usually) be written out in this MSB form. However, more often, MAC addresses tend to be displayed in what is called “canonical” form. The reason this matters is because sometimes non-canonical form may be used, while other times canonical form may be what gets used or referred to. So knowing which form is being used may matter in some cases (such as when viewing an unfiltered display of what bits get transmitted on a cable). Also, knowing how to convert between the two formats may be useful. To convert to or from canonical form, first split up the information (such as the bits of a MAC address) into octet bytes. Then take each byte, and convert from MSB to LSB or from LSB to MSB: in either case the process involves simply reversing the order of the bits within that byte. Understand that when there is more than one byte, the re-ordering of the bits is something that happens within each individual byte. As a quick reminder, bytes are commonly represented with a pair of hexadecimal digits (where each hexadecimal digit represents a nibble). So, first the bits of the first part of hexadecimal digits are reversed. Then, the bits of the next pair of hexadecimal digits are reversed. The order of the bytes themselves are not reversed; only the order of bits within each byte. To help match the binary and the hexadecimal in the above example, understand that the hexadecimal nibble E represents the fourth nibble, and so it represents the fourth set of numbers, 1110. To convert the first byte of this example, 1010 1100, from MSB to LSB format, the first eight bits are written out in reverse order. What was first becomes last, and what was last becomes first. So the result is 0011 0101. Next, after converting the first byte, the second byte becomes converted, resulting in the second converted byte looking like 0111 1011. After the bits of the third byte are written in reverse order, the third byte looks like 0001 0010. The fourth and fifth bytes look identical after writing their bits out in reverse order. The final byte is converted from 0000 0001 to 1000 0000. The end result string, after conversion, is 0011 0101 - 0111 1011 - 0001 0010 - 0000 0000 - 0000 0000 - 0000 0001. Now that all the bytes have had the order of their bits reversed (even though the position of each byte is unchanged), the result converted back to hexadecimal looks like: 35-7B-12-00-00-01. Both the original text AC-DE-48-00-00-80 and the converted text 35-7B-12-00-00-01 may be referring to a single NIC using a single MAC address, where one of these strings represents canonical LSB format and the other represents non-canonical MSB format. Both AC-DE-48-00-00-80 and 35-7B-12-00-00-01 may represent the exact same address, simply written out differently. (As an analogy for English speakers: “twelve”, “12”, and “dozen” may all be different ways to write out the same value.) So, if there is a possibility of addresses being represented in both forms, then knowing which form is being used may be needed to properly understand what address is actually being used. With enough thought, study, and/or familiarity, one can see that the post-converted number has the same amount of bits set to one as the pre-converted number. As most easily seen in the example (by viewing the final bit that is set to one), the twelth nibble of the pre-converted number will have the same amount of bits set to one as the eleventh nibble of the post-converted number. The amount of bits with a value set to one (instead of being cleared to zero) in the pre-converted number will affect the opposite nibble of the same byte in the post-converted number. The numbers within any specific byte of the pre-converted number do not affect the numbers of other bytes in the post-converted number. Interpreting the bits on a wire (or reading IEEE documentation which shows the bits on a wire) or interpreting bits from the hardware address on the card, and trying to compare that non-canonical address to a displayed/printed canonical address, could lead to some confusion. For most end users, there is only one specific format that is most commonly used, so this ends up being a non-issue. However, if and whenever performing an activity where the formatting of being canonical or non-canonical may be an issue, at least knowing about the issue can be helpful. Non-canonical (“MSB” ordering) represents the address on the card. The first bit of non-canonical represents what goes over the LAN. MSB is also more intuitive (the first digit, which is a bit, is the “most significant”). So, why would canonical (which uses intra-byte “LSB”) ever be used? One reason, which may be among the most important, is the end user experience. As inconvenient as dealing with the whole “MSB or LSB” issue may be, end users may see a canonical MAC address written on the card. Ideally, what the end users see on the card should generally match what the software reports. Also, many pieces of software will typically use canonical addresses. Confusion may be lessed if a user sees a canonical address and then reboots to another operating system and then sees the same address, instead of a different address. Therefore, programmers should be careful to be reporting the canonical MAC address when displaying a MAC address. RFC 2469: Caution (regarding canonical bit ordering) notes, “In most cases, such fields must be in” canonical form. So, the simple reason why canonical form must frequently be used is just because, as a standard, it is what actually gets used. Canonical represents, as a standard (or at least common practice), how the address gets stored in memory. However, the computer realizes that all bits in memory are going to be sent in reverse order. Therefore, when the addresses are transmitted/received over the wire or obtained from the card, the addresses get reversed and a conversion between canonical and non-canonical order happens. Going back to an example of non-canonical form again: Hardware manufacturers take the OUI that is typically published in canonical format, and convert it to a non-canonical address when they store the address in the card. 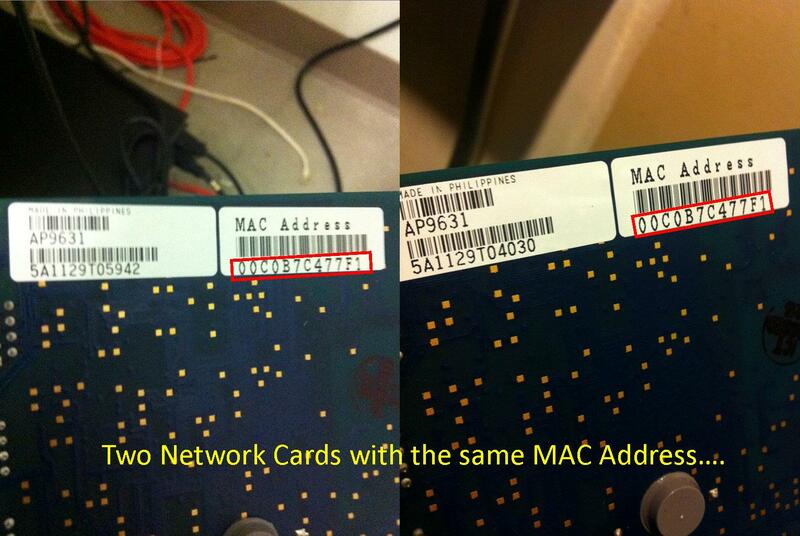 (The address on the card does not contain the card's canonical MAC address. It contains the results of converting the canonical MAC/EUI-64 address into another address, which is stored in non-canonical format.) When getting the actual address that is reported by the card, programmers should be careful to make sure that the address read from the card is converted to a canonical address before the address gets displayed to an end user. As a re-hash contrasting canonical and non-canonical: The order that the bytes themselves are still sent over Ethernet in the same order. This means that the order of the bytes is not reversed, and does not change in any way. Therefore, if a non-canonical address of 82-FF-FF-FF-FF-FF was sent, the first four bits sent would be 0100 (which represents the digit 2, but with the least significant bit first) and the second eight bits would be 0001 (to represent the number eight with bits sent in LSB order). Out of the 48 bits of a typical EUI-48 MAC address, it is the eigth bit of a canonical address that will get sent over the LAN first when LSB transmission order, like Ethernet, is used. This is elaborated upon with RFC 2469: Caution (regarding canionical bit ordering). Wikipedia's article on “MAC Address”: section called “Address details” states, “The IEEE expects the MAC-48 space to be exhausted no sooner than the year 2100;”, and (at the time of this writing) cites an IEEE PDF document which does not seem to mention the year 2100. In theory, every NIC should have a unique MAC address. In practice, that may not be true. First, the MAC address communicated over the network is determined software. Customizing the MAC address used by the operating system's network stack is generally simple in Unix, and may also be done with several drivers for network cards in Microsoft Windows. Second, the MAC address of software is generally determined by what is on the card. Even early physical network cards could often be manually re-assigned. Third, with the advance of virtualization, virtual machines may frequently end up creating MAC addresses that are not in any way centrally monitored. Finally, there are cases where the same physical MAC address may be used by multiple NICs that come out of some factories. This probably is not supposed to be the case, and known instances of this may be fairly rare, but they do exist. One example is shown by a photo of two APC UPS AP9631 NMCs using MAC 00C0B7C477F1. A well known speaker related to IPv6 networking has also made the comment that HP servers (perhaps especially refurbished ones?) are known to sometimes have re-used MAC addresses. Duplicate MAC addresses causing problems are so uncommon that technicians generally do not check for duplicate MACs as new NICs are used. The rarity of detected problems may be helped by the fact that duplicate MAC addresses typically won't typically be mattering for devices that are not on the same subnet. However, know that even if they shouldn't exist, they could. Care should be taken when creating virtual devices to ensure that MAC addresses are unique. Virtual machine software, such as Qemu, might often default to using a specific initial MAC address when a virtual machine is created. This could lead to a higher chance of MAC address conflicts than what is commonly seen with physical equipment. (Such an issue is likely quite easy to remedy, once the issue has been identified. It may involve shutting down (virtual) equipment, as the virtual hardware's change may need the system to restart. However, it is possible that a temporary change (effective until the system is restarted) might be possible: see spoofing/setting a custom MAC address. MAC addresses are considered easy/trivial to change. It can often be done (at least temporarily) using just the software that is bundled in with modern operating systems. Therefore, MAC-based security options are not considered to be strong security. Changing a MAC address is often known as “spoofing” the MAC address. Details on how to do this are at: manually setting a network address. If a computer system has an IPv4 address of another machine, the “Address Resolution Protocol” (“ARP”) may be used to attempt to determine the remote system's MAC-48. If the remote system supports the common implementations of TCP/IPv4 over protocol that uses OSI Model Layer 2 (e.g. Ethernet), and if the remote system is in the same subnet as the system making the query, such as ARP query should typically work. Otherwise, any communication to that device is expected to fail. Different than RARP. Not to be confused with Reverse ARP (“RARP”). The purpose of RARP, like BOOTP and DHCP, is for a computer to be able to obtain its own IPv4 address. In contrast, InARP is about a (functional) computer obtaining the IPv4 address of a different device. The concepts may be a bit similar, but are not absolutely identical, and these are different protocols. MCSA/MCSE Implementing, Managing, and Maintaining a Microsoft Windows Server 2003 Network Infrastructure (book published by Syngress) says, “On nonbroadcast-based multiple access (NBMA) networks, such as wide area technologies including ATM, frame relay, and X.25, the network interface address is not the MAC address. Instead, it is a virtual circuit.” ... “Inverse ARP (InARP) is used to resolve the IP address on the other end of the virtual circuit. InARP was specifically designed for frame relay circuits.” Similar text can be found on the first couple of paragraphs of Davis J., Lee T. Win Svr 2003 TCP/IP book, pages 29-30. IPv6 automatic addressing (broader section, which is sure to have some information about NDP mentioned somewhere (in the main text, and/or referenced sub-sections). For MAC-48 addresses, IETF BCP 141: IANA/IETF/Doc Usage related to IEEE 802 (and, more specifically, IETF RFC 7042 section 2.1.1: MAC addresses reserved for IANA and, an even more focused section, IETF RFC 7042 section 2.1.2: MAC addresses reserved by IANA for documentation) notes the 01-00-5E- MAC address range 01-00-5E-00-53-00 through 01-00-5E-00-53-FF for Unicast examples, and 01-00-5E-90-10-00 through 01-00-5E-90-10-FF as multicast addresses reserved for documentation. This was found by checking out: IANA: Ethernet numbers, which does refer to (or has referred to) RFC 7042. Also, 00-00-5E-00-42-?? may be a range of documentation addresses, as noted by RFC 7042 section 3.2? Although, this did appear to be more related to the “protocol” field. The “Modified EUI” format described by RFC 4291: “IPv6 Addressing Architecture” section 2.5.1: “Interface Identifiers” (especially after the start of page 8) simply reverses the meaning of the seventh bit (the universal/locally administered bit) of the address. By making this one change from the interpretation specified by IEEE's standard for an OUI, locally administered OUI's will have a zero. The end result allows many privately-assigned addresses to be better condensed by IPv6's double-colon. Since MAC-48 addresses may be embedded in EUI-64 addresses, this naturally means that the information about MAC-48 addresses could be used to find some EUI-64 addreses that may be used. However, there is some additional documentation specific to EUI-64. IETF BCP 141: IANA/IETF/Doc Usage related to IEEE 802 (and, more specifically, IETF RFC 7042 section 2.2.3: EUI-64 addresses may provide such details. For more details (such as details about the OUI), see the broader topic EUI addresses, which includes details relevant to this topic of EUI-64.